I was inspired from Stevie's post (cant find the link) on High Heels & Hockey about being the parent of a very young hockey player. I wanted to answer some questions to anyone out there who wants to put their kid in hockey put have maybe some anxiousness or uneasiness about how it all works. yeah im proud! want to fight about it? 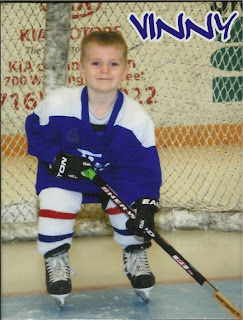 My son Vinny is 4 and has a love for hockey. If there was a word I could use that would give more profound meaning I would use it. This kid craves hockey practice on Wednesdays and Saturdays and occupies his time playing in my kitchen, watching the Penguins on TV, and going to our local Junior club the Jamestown Ironmen when he's not actually on the ice. I mention this because it is probably the biggest and most important obstacle when getting your kid into hockey - they have to want to. I've seen about a dozen or more kids that are in the Timbits Hockey Program that are forced into it and THEY HATE IT. I get that you maybe a hockey fan but if you're kid isn't into it, those 8am practices aren't going to be easy for anyone. If your kid wants to play get them into a program, any program, as soon as they express interest. I have to admit when I put Vinny into the Timbits program I had a million questions and anxieties about the whole entity of being a hockey dad. There are alot of myths and objections that I've heard before I signed Vinny up most of them were untrue so I thought I'd list some and dispel all these antiquated ideas about getting your child into hockey. Relatively speaking, yes, hockey can get expensive. If you compare it to soccer cleats or a baseball bat, hockey equipment can get up in price but it doesn't have to be that way. USA Hockey donates countless equipment to programs all over the nation. In most cases the program will be signed up with them to receive donations. Vinny was equipped from head to toe FOR FREE with previously owned equipment. Another option I've heard of other programs doing is putting a deposit on your child's equipment and you getting majority of it back it you don't steal or break any of it. Personally, when Vinny really took to playing hockey I started to chip away at his own equipment. Buying skates or a helmet are pointless if you are given rentals because your kids grow so quickly it becomes pointless. 2. 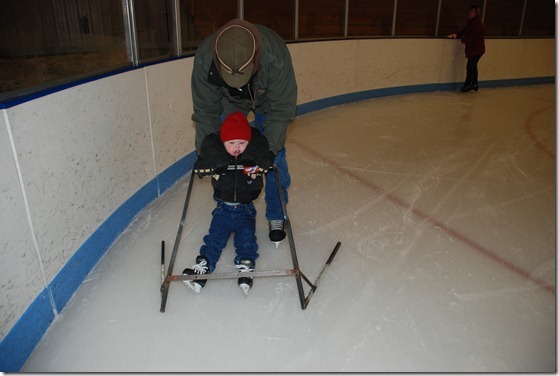 My kid can't even skate! How is he going to play hockey?! This is not me, its a stranger. I can't speak for all programs, but in most cases they are ready for that. Vinny stepped on the ice once previously to playing hockey that ended in a maddening tantrum. The very first day of practice they give the little ones a folding chair to hold on to, or a cool looking helper thing. You won't believe me but the average time a kid spends on a chair is 5 practices max. The younger they are the quicker they learn it seems. As soon as Vinny was given his stick he left the chair behind. There were coaches to specifically worked on the "chair squad" their patience and sense of humor were just an incredible thing to watch. From about 20 kids on chair at the beginning - 10 weeks later - not one kid uses a chair and they all play games. 3. Hockey is too fast and violent, I don't want my kid to get hurt. Your kid will be fine. They have equipment all over the place which they make impossible to fail. The kids never build up enough speed to hurt themselves and on the contrary once they figure out that falling doesn't hurt them they will develop the bad habit of slamming into the boards as hard as they can to generate the most disruptive noise they can. I've also seen kids collide, fall on each other fall into the boards, and I haven't even see one tear out of probably 40 or so kids. Also, fighting or checking don't happen at this level of hockey. It seems strange typing that but these are real questions I've been asked by interested parents. 4. I don't want my kid to sit out games because he's not good. If you think games at this level resemble anything that you've seen on TV you are wrong. The kids go out on the ice fall all over the place and the only scoring is accidental. The kids and parents love it for totally different reasons. Very little structure or rules are enforced. It's basically them having fun and making sure they are safe. They don't even keep formal score in most cases. It will make you proud SO of your kid when they are out there shooting, passing, or accidentally piling into the goalie with 5 other kids. 5. There are no programs for girls. No there aren't. They play with everyone else. In the Timbits program about 25% of them are girls who love the sport. As long as the passion is there - let them play! To wrap up I have some quick tips that I have learned over these handful or weeks that may help you through your first year of being a hockey parent. If you get used skates, sharpen them at least once. If they are learning it will make it EXPONENTIALLY easier for them to learn efficiently. Tape your kid's stick uniquely. You will lose track of your kid on the ice. It's crazy. Sometimes the stick tape is the one thing I can look for the figure out where he is on the ice. I've also put a cool racing strip on his helmet so I can spot him out in a pile of kids in the net. Always offer a hand when you can. Whether you can skate or not there might be a little bit you can do to help out the coaches. Just ask they will appreciate it. They are volunteers and have to handle the demands of 50-60 kids and parents all at once. Make falling hilarious. When they fall try not to express your instinctual concern. Make it funny, or encourage them by saying "good fall". They will fall hundred of times and overcoming the trepidation of the first few spills is a huge part of having your kid enjoy playing. Let the coaches coach. Its tempting to hang around and give advice or yell at your kid for screwing around but ex-NHLer Paul Laus gave me some advice when Vinny was being a little too aggressive on the ice. He told me "Make sure he doesn't hit anyone from behind, but besides that let the coaches coach." It might be hard to suppress the knowledge you've acquired playing NHL on PlayStation for a decade but the coaches know what they are doing. Finally, you cant teach them to love the game. They do or they don't its a very organic progress. I mention this again, because I've seen it. I've seen the dad who plays beer league and tries to get their kid into it. It doesn't work and everyone is miserable.